Preheat the oven to 450°. In a medium bowl, whisk the flour with the cornstarch, baking powder, garlic powder, 1 1/4 teaspoons of salt and 1/2 teaspoon of pepper. Add the chilled sparkling water and whisk until a smooth batter forms. In a small saucepan, warm the hot sauce with the butter over moderate heat until the butter is melted. Keep warm. Lightly brush 2 rimmed baking sheets with canola oil. Dip the cauliflower florets in the batter, letting the excess drip back into the bowl, then arrange them on the prepared sheets. Bake for 10 to 12 minutes, until the batter is just beginning to brown and the cauliflower is just tender. Drizzle the buttery hot sauce over the cauliflower, toss gently to coat and bake for 18 to 20 minutes longer, until the sauce is lightly caramelized. 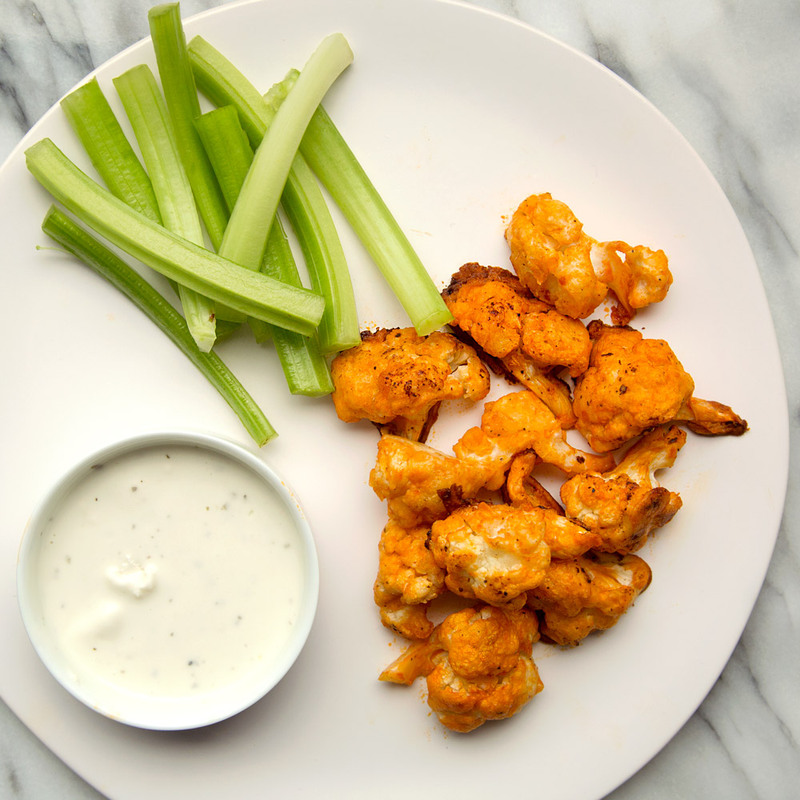 Season the buffalo cauliflower with salt and serve warm with blue cheese dressing and celery sticks. Review Body: At first I thought they looked like boneless chicken wings, but they're just cauliflower.